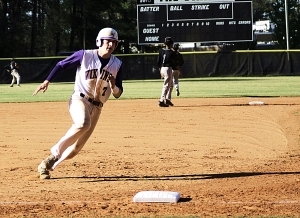 Lakeside’s Charlie Ludwick rounds third during the regular season. Thirty-six seniors suit up for the last time as high school baseball players as they take the field in the 16th Annual DCSD Senior All-Star Baseball Classic at 7:00 pm on Tuesday, May 29 at Stephenson High School. The West leads the current series (2013 to present) 3-2 following last season’s 10-9 thriller to make it two consecutive for the West over the East. The East All-Stars are going for the tie in the series led by two-time defending Region 5-5A champion Arabia Mountain’s Eric Hoxie and Lithonia’s Samuel Marion. Arabia Mountain’s Mr. Do Everything Corey King leads a quartet of Rams on the team. King led most of the offensive categories in DeKalb this season including batting average (.556), doubles (12), RBI (49), triples (4) and stolen bases (47). He also had the 4th best earned run average (1.33) while going 7-1 on the mound with 52 strikeouts in 42 innings pitched. Other Rams include Silas Butler (.381, 29 RBI, 38 SB), Jalyn Hawkins (.3801, 18 RBI, 44 runs, 36 SB) and Josh Campbell (.387, 22 RBI). Redan also has a strong contingent in the county’s second leading hitter Lyndon Weaver (.511, 23 RBI, 47 hits, 38 runs, 6 doubles), Kelvin Smith (.458, 24 RBI, 7 HR, 35 runs), Taj Bradley (.427, 19 RBI, 31 runs) and Orlando Adams (.380, 6 HR, 35 RBI). Other top offensive performers for the East includes Lithonia’s Jerrold Bibb (.435), Miller Grove’s Zandon Finch, .351, 11 RBI), Southwest DeKalb’s Jeremy Hatchett (.369, 13 RBI) and Tucker’s Miles Grayson (.333, 16 RBI, 9 doubles, 3 HR). The East pitching includes Bradley (5-0, 1.02 ERA, 55 Ks, 41 2/3 IP) and Grayson (5-3, 5.03, 43 Ks, 30 1/3 IP) join King to help go the distance. The West counters with Lakeside’s Carlos Hernandez (.472, 28 RBI, 3 HR, 3 triples) and Cedar Grove’s Rashad Preston (.440, 22 RBI, 9 doubles, 28 SB) as Decatur’s Robby Gilbert and St. Pius’ Chad Garrison work to extend the West’s streak to three consecutive wins. Druid Hills’ Thomas Weingartner (.413, 18 RBI, 6 doubles, 2 HR, 2 triples) and Dunwoody’s Jack Hardin (.398, 25 RBI, 10 doubles) also add to the lineup including six playoff teams. Chamblee’s Norman Kelly (.378, 33 RBI) and Lakeside’ Jackson Mathis (.368, 29 RBI, 10 doubles) are also big offensive threats for the West. The West pitching staff is led by Chamblee’s David Albuquerque (1.29 ERA, 41 Ks, 38 IP), Columbia’s Elijah Hammonds (3-5, 2.45 ERA, 50 Ks, 45 2/3 IP) and Druid Hills’ Mason Curtis (5-6, 5.09 ERA, 61 Ks, 42 2/3 IP). Possible rain on game day could lead to a tentative postponement date of Tuesday, June 5 at 4:00 pm (Juniors) and 7:00 pm (Seniors) at Stephenson High School.